Village Gram Swaraj Sabha's, for all adults (above 18 years of age). It has the membership of all the families in the village. A President and a Secretary are chosen by the members from among the regular attendants at the Gram Swaraj Sabha. Kshetriya Gram Swaraj Sabha's. It is a representative body of Gram Swaraj Sabha's, at the level of each field centre of the Ashram (i.e. the Village Development Centre or Gram Nirman Kendra). The President of this Ksetriya Swaraj Samiti is chosen from among the Gram Swaraj Sabha presidents and the Ashram is represented in this Sabha by the centre in-charge, who is its Secretary. Kendriya Gram Swaraj Sabha. It is the group of Presidents and Secretaries of the 13 Kshetriya Gram Swaraj Sabhas, with the Banwasi Seva Ashram Secretary as its President and the person in charge of the Village Development and Village Self Rule department of Banwasi Seva Ashram as its Secretary. Sonbhadra district is a hilly region and the settlements are dispersed. It is not possible for everyone to gather at a revenue village or at panchayat level. That is why a separate Gram Swaraj Sabha is formed for these dispersed settlements. 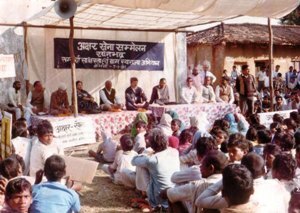 Till March 2003, 431 Gram Swaraj Sabha's were formed in 230 revenue villages of 134 gram panchayats in the work area. These Sabha's are associated with the 13 Village Development Centres of Banwasi Seva Ashram. Gram Swaraj Sangathan has played an important role in the long struggle for land entitlement, and contributed a lot in the clearance of the 50,000 cases related to land rights which were pending in the Lok Adalats. It also deals with corruption cases, liquor drinking menace, atrocities on women, harassment and family disputes. Its recent involvement is in assuring filing of claims of all deserving forest dwelling persons under the provision of the Forest Rights Act of 2006. Representation of women in Gram Swaraj Sabha's is being promoted. There are 10 women presidents and 5 women secretaries. An annual experience sharing and planning for future programmes workshop is organised at Gram Nirman Kendra's and a conference takes place at the central level on 6’th November (Memorial day of Shri Prembhai, late secretary of BSA) each year.